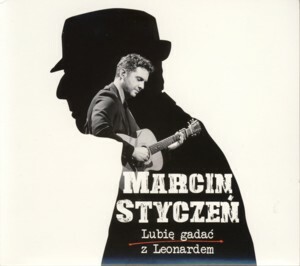 This is an album of songs by Leonard Cohen recorded by Polish singer Marcin StyczenFind albums by this artist. The album presents eleven songs originally included on the last three albums by Cohen, which Styczen translated into Polish. These songs have not been previously translated into Polish or performed by other Polish Artists. The musical arrangements were done by keyboardist Marcin KuczewskiFind albums by this artist and guitarist Tomasz PfeifferFind albums by this artist, drummer Chris AikenFind albums by this artist and violinist Marta ZalewskaFind albums by this artist provide the background accompaniment. There is also a bonus track, which presents one of the songs captured live. The album was funded by the Polish crowdfunding platform "Polak Potrafi". Cohen is an icon and it takes a lot of courage to touch his songs on any level, especially so his late material, which was even darker and more introvert than his earlier creations. Translation is a risky, immensely difficult and usually ungrateful task and therefore this is the most significant layer of this album as far as I am concerned. Overall Styczen managed quite well in this respect, with the Polish texts if not always very closely resembling the originals, convey the spirit and if not all at least some of the subtext. The translation is oriented to fit the music as well as possible, which in many cases is extremely tricky when translating song lyrics. Of course I´d prefer Polish listeners to study English and understand the original lyrics, but this is possibly the second best. The musical arrangements, which are rather minimalistic and quite elegant, suit this music well and in spirit are close to Cohen´s principles, which emphasized the words and kept the music on a second plane, being a vehicle rather than the essence. The playing is professional, as expected, but there are no moments of exceptional virtuosic showmanship, which perhaps is for the best in this format. The actual singing on this album is slightly disappointing for me. It seems that Styczen is trying to force his voice to be similar to Cohen´s, which of course is beyond his vocal abilities. His diction and pronunciation are correct and so is his Cohen-like delivery, but the dark and somewhat husky tone of his voice sounds unnatural. The best proof of this is the difference between the live version of "Going Home", where he sounds natural and the studio version of the same song. But of course these are matters of taste, nothing that should hinder the overall impressive achievement. Overall this is an ambitious and well produced and executed album, which has its artistic merit and should bring a lot of delight to Polish admirers of Cohen and his music. The album is very well recorded, with crystal clear ambience and excellent sound quality, which makes the experience of listening to it even more pleasurable. Well done!